I joined the product swap that was going on over at Mrs. Stanfords Class. The boards have the directions at the top. The directions are clear and my first grade son could read them with ease. I asked my son if he wanted to play a game with me and I let him pick a board. We first played using the same board. I wanted to make sure he understood, but he had it and wanted me to play my own board. Of course while Chad and I were playing my 2 year old daughter had to play also! So Maggie and Aunt Hillary began playing their own board! We had to play this game 5 different times:) My son LOVED it! 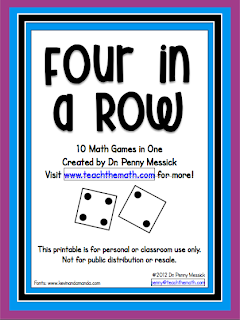 These games help with mental math facts...and the kids don't even realize it. Chad wanted to play the cover all for the last game. I am always looking for educational games for my kids to play and this one is a winner! I'm glad I have a copy of this, so we can have a game night again soon. Aunt Hillary and Maggie were playing their own game. She would show Maggie a number and cover it. Then she would tell Maggie to find the other number just like it. These were even useable with a 2 year old! The possibilities are endless!! awww I love that you used your children!!! Thanks for all the wonderful ideas for the classroom. I have nominated you for an award. Stop by my blog to pick it up! Love your ideas! Very practical! I nominated you for a blog award. Visit my site to accept. Thanks for following my blog! I love your ideas! If you have time stop by my blog and join my "Classroom Tours Linky Party"! I would love to see your room!! Thanks for reviewing my game Kathi! I love the pictures and it looks like your sweet kids loved the games!! I want to link to this post to share it with my readers! Thanks again!! please drop me an email if you want to learn more.